Impaired Detoxication of Hydrogen Sulfide in Ulcerative Colitis? 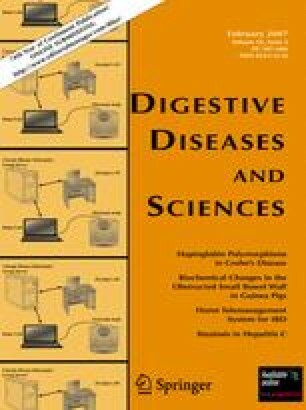 Impaired butyrate oxidation and raised counts of sulfate-reducing bacteria in the colon of patients with ulcerative colitis (UC) indicate that the disease may be induced or aggravated by hydrogen sulfide toxicity. We aimed to examine enzymatic removal of H2S in erythrocytes and colonic mucosa from controls and patients with UC and Crohn's disease (CD). Rhodanese (RHOD) and thiol methyltransferase (TMT) activities were measured in rectal mucosa and erythrocytes, and plasma thiocyanate was determined. Four groups were analyzed: patients with UC, patients with CD, hospital controls (patients with dyspepsia or IBS), and a group of healthy volunteers. RHOD and TMT activity in rectal biopsies did not differ significantly between controls and patients with UC or CD (n=56). Control levels of RHOD were significantly higher in men than in women (212±25 and 132±14 nmol/mg/min, respectively; P<0.01). In erythrocytes (n=128) RHOD activity was significantly higher in UC patients than in hospital or volunteer controls (1.15±0.12 compared with 0.88±0.12 and 0.66±0.02 nmol/mg/min; P<0.05 and P<0.02, respectively). TMT activity was also significantly higher in erythrocytes from UC patients and hospital controls than volunteer controls (2.02±0.13 pmol/mg/min [P<0.001], 1.51±0.21 pmol/mg/min [P<0.05], and 1.17±0.18 pmol/mg/min, respectively). We found no evidence of defective enzymic detoxication of sulfide by RHOD or TMT in patients with UC or CD. This work was funded by The Wellcome Trust.